This theme has been created by Microsoft Most Valuable Professional Vishal Gupta. Apart from being our co-member and moderator in MeraWindows, his other identity is author of nice website askvg.com, epic tutorials on free tweaking tool Resource Hacker. This Article Has Been Shared 2494 Times! The much awaited Windows 7 theme leaf with six subthemes is here! 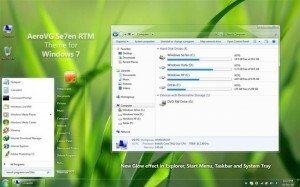 Cite this article as: Abhishek Ghosh, "AeroVG Se7en for Windows 7," in The Customize Windows, October 20, 2010, April 21, 2019, https://thecustomizewindows.com/2010/10/aerovg-se7en-for-windows-7/.